STATE CAPITOL, PHOENIX – Today Arizona Legislative Democrats released an education funding plan that will give public schools nearly $4 billion, without raiding funding from future generations and without increasing taxes. “Our plan will put nearly $4 billion into public schools over the next 10 years, protects the long-term health of the state land trust fund, and puts dollars in the classroom now,” House Democratic Leader Eric Meyer, D-Paradise Valley (District 28), said. Meyer added that concerns are mounting about the governor’s idea to cut into the principal of the state land trust’s permanent fund. Arizona State Treasurer Jeff DeWit recently criticized that proposal, in part because it creates a fiscal cliff in five years and hurts the principal of the fund. The Joint Legislative Budget Committee estimates a loss of $3.2 billion in value under Ducey’s proposal. The Legislative Democratic proposal maintains the existing distribution of funding from the state land trust proceeds, which is currently 2.5 percent, and the $74 million inflation increase approved in the 2015-2016 fiscal year budget. It will allocate new revenue from the $278 million in projected 2015-2016 fiscal year surplus to K-12 funding in the current fiscal year and $250 million in ongoing revenue to school funding in future years. Additionally, the plan would freeze the expansion of the corporate school tuition organization tax credit program beginning the 2016-2017 fiscal year to produce an additional $10 million in revenue dedicated to the K-12 budget. This will ensure that funding levels can be maintained. Existing tax credit funds for STO scholarships would not be reduced under the plan. 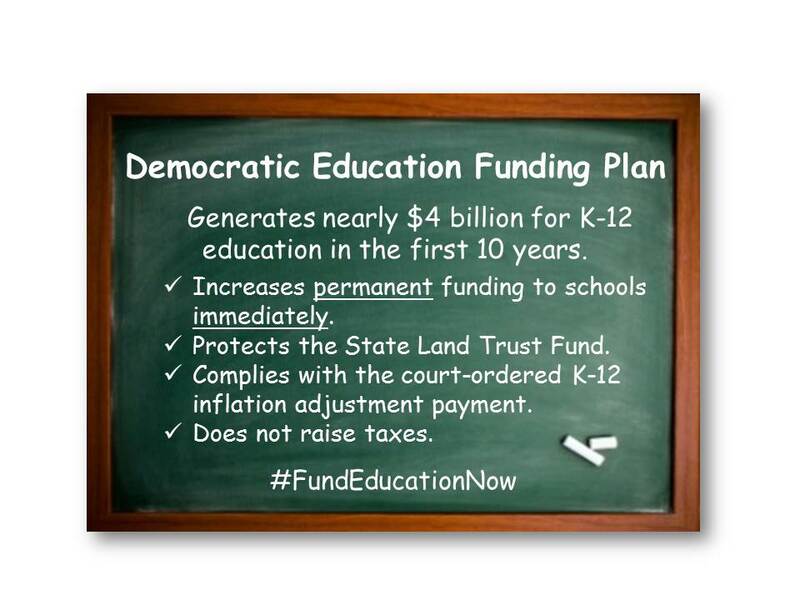 Click to download a full 10-year analysis of the Democratic education funding plan. I would need to study this more, but it sounds like a better alternative for our schools. There is nothing more important than better funding for education in Arizona. Without it, corporations and smaller businesses will never want to move here. It is difficult to hire qualified employees from another state when they look at our horrible statistics in regard to education at all levels. Thank you, AZ Dem Senators!!! I applaud freezing "the expansion of the corporate school tuition organization tax credit program beginning the 2016-2017 fiscal year to produce an additional $10 million in revenue dedicated to the K-12 budget." And, that funds are not taken from First Things First and the state land trust. Will the AZ Republic give media attention to this plan?